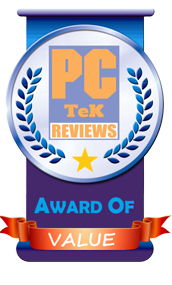 30 August, 2017 Rakesh Sharma Reviews . 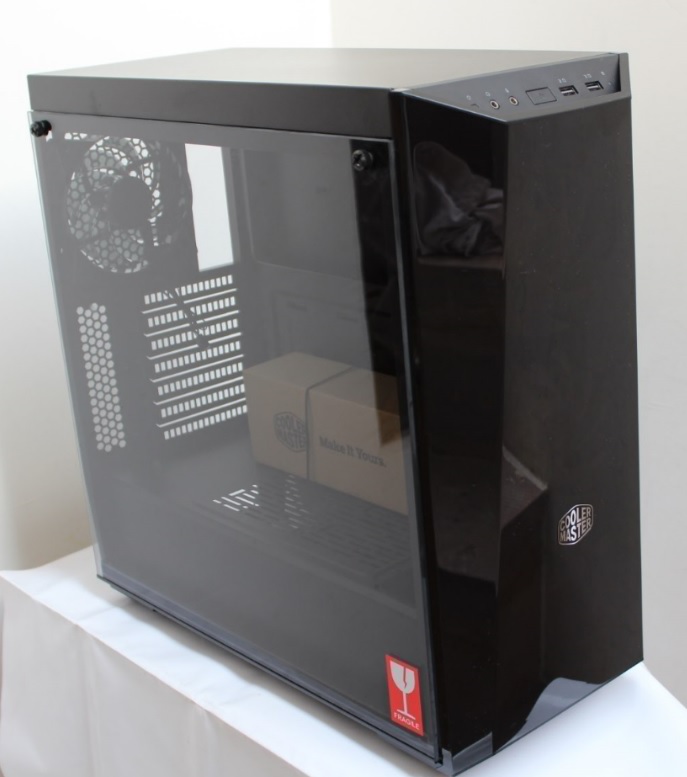 Today every Computer case manufacturer is bringing new cases with tempered glass and RGB lighting. 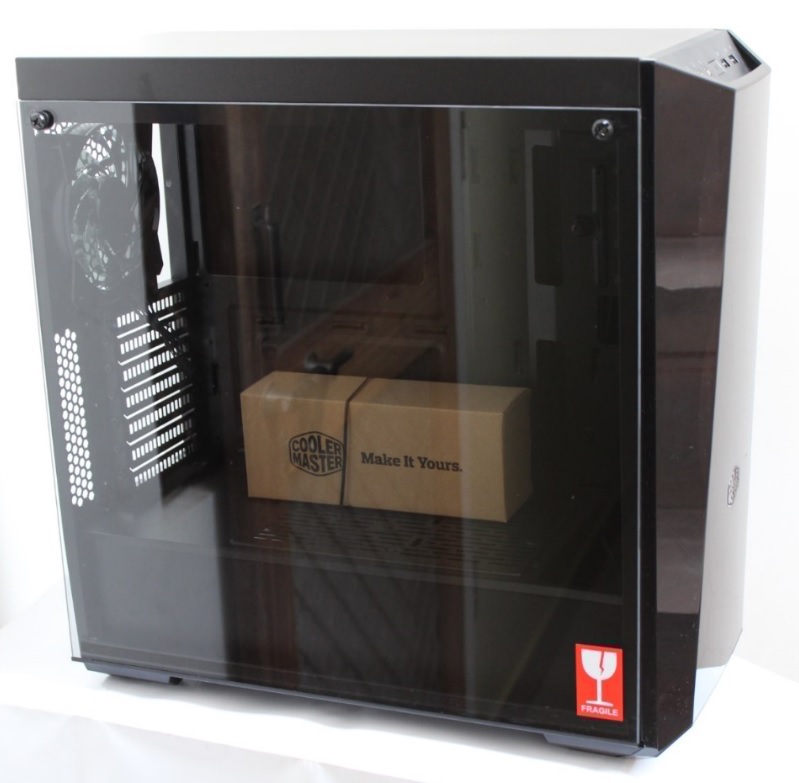 Designs varies from one or two side panel tempered glass cases to the full all side covered tempered glass goodness. 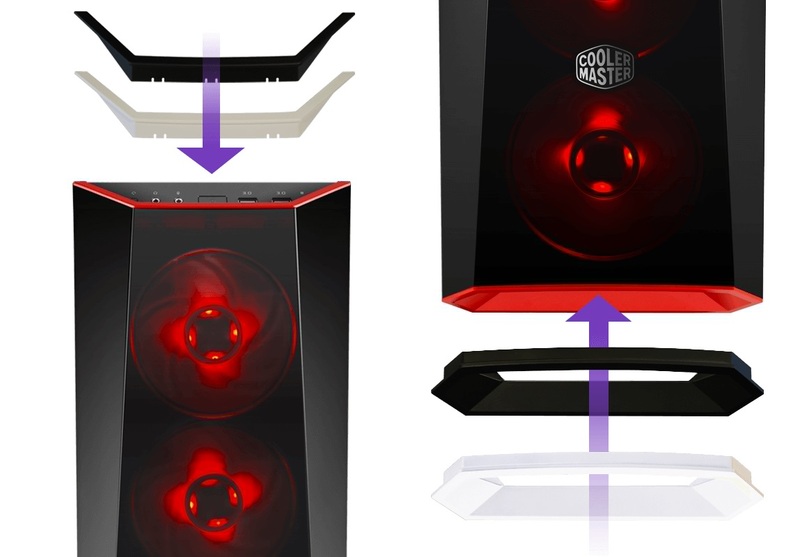 No dough about the aesthetic enhancement a case gets with tempered glass and RGB lighting. 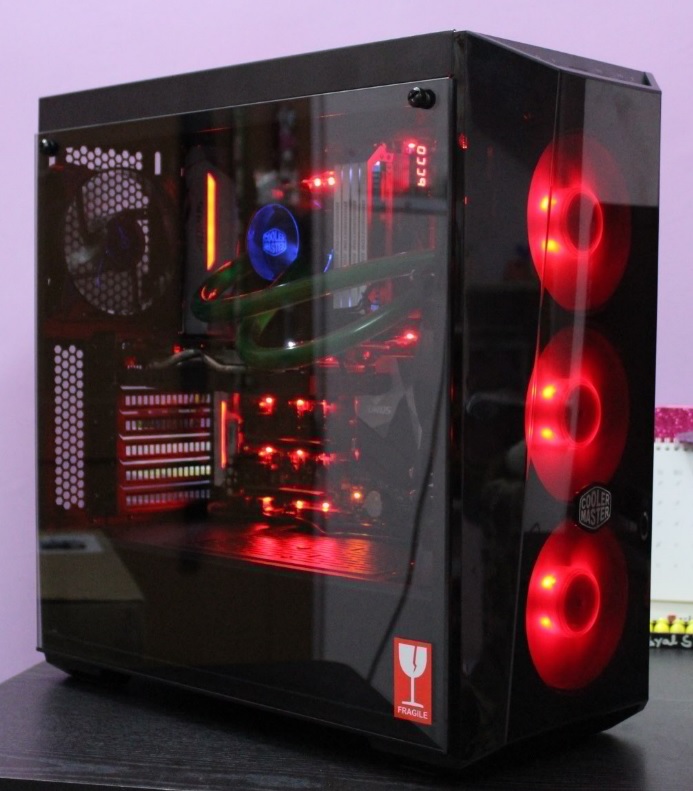 But all this case aesthetics comes with a price and mostly all such cases are visible at a top-mid or high price segment only. 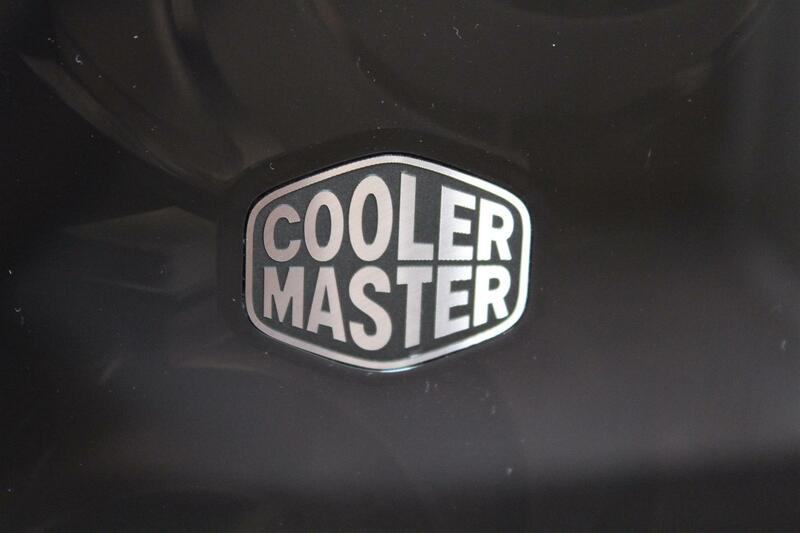 Today we are reviewing a case from Cooler Master. 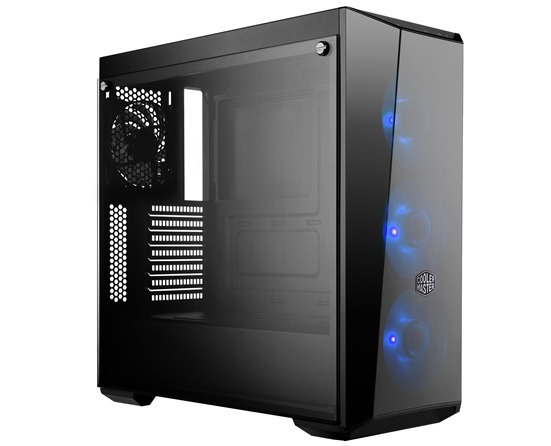 A mid range case with tempered panel, RGB fans and above all it carries the design and performance characteristics from the well known Master Series cases, the Cooler Master MASTERBOX LITE 5 RGB Case. 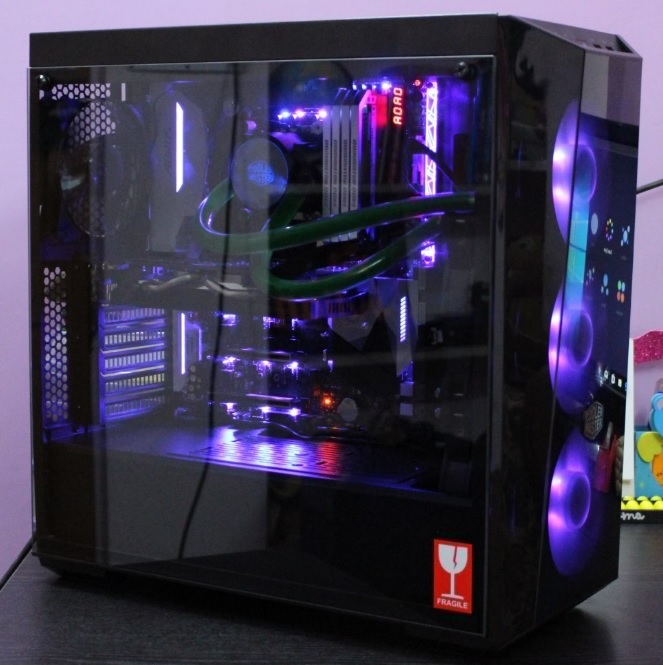 Nice looking case with 4mm thick tempered glass side panel and three 120mm RGB fans installed at front, adding great style with easy customizable lighting with RGB fans. 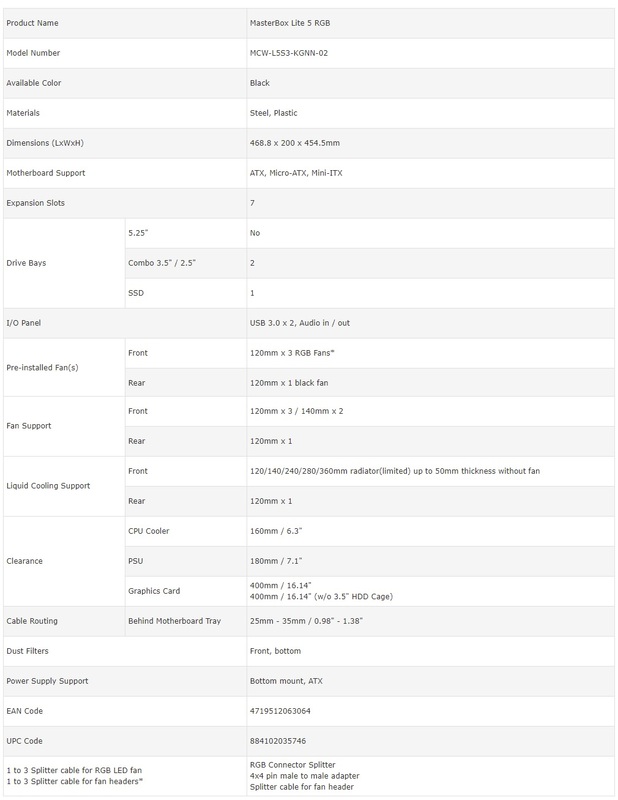 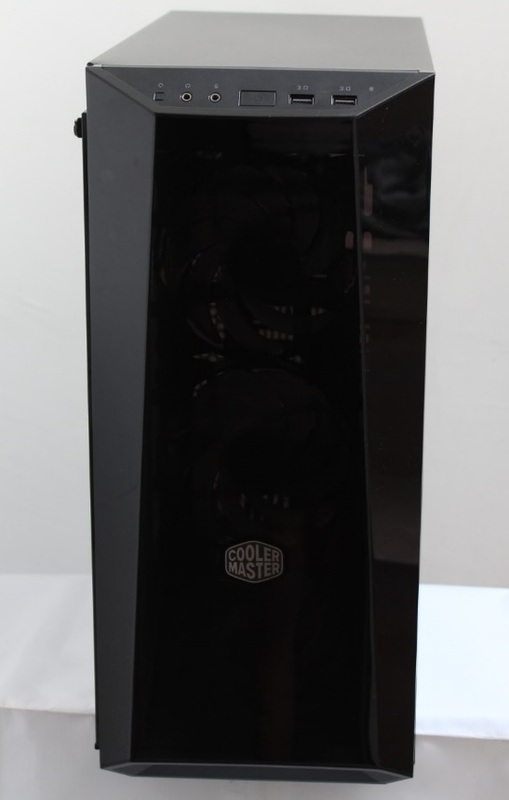 Now let’s have a look on what features does Cooler Master MASTERBOX LITE 5 RGB case have for us. 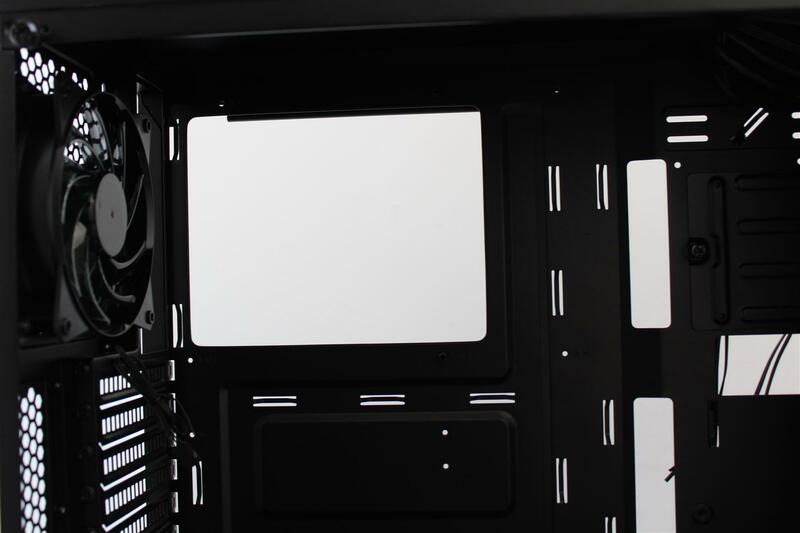 Show off your perfect build and powerful components through the 4mm thick, edge to edge, tempered glass side panel. 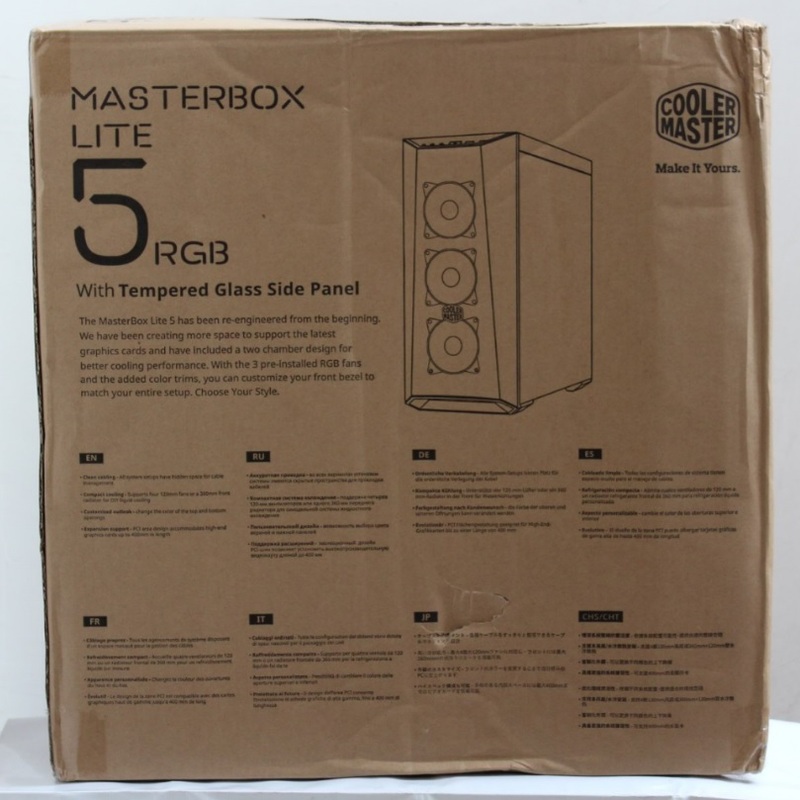 Standard plain brown packaging with product outline image and few paragraph describing features outside. 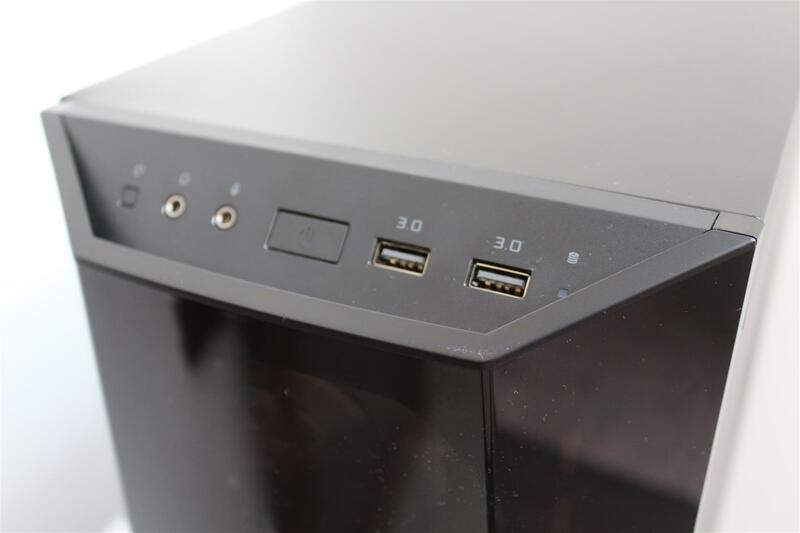 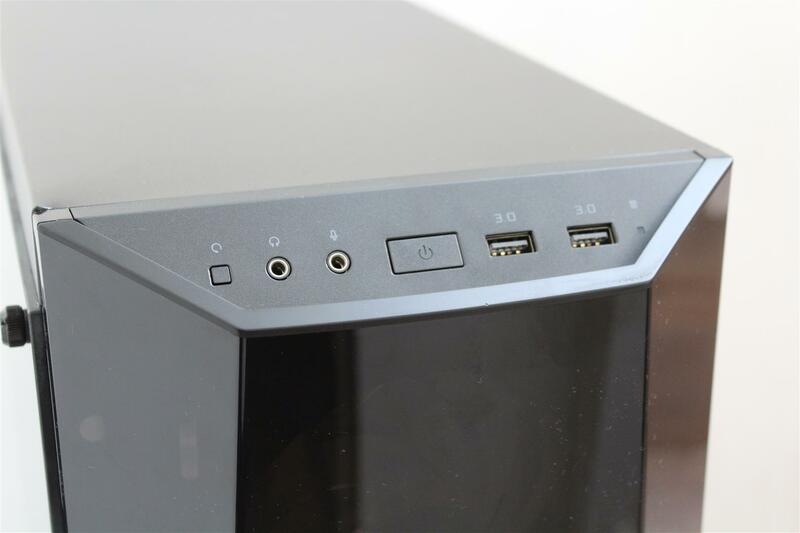 Front USB 3.0, Power button, Reset button, audio ports and HDD activity LED. 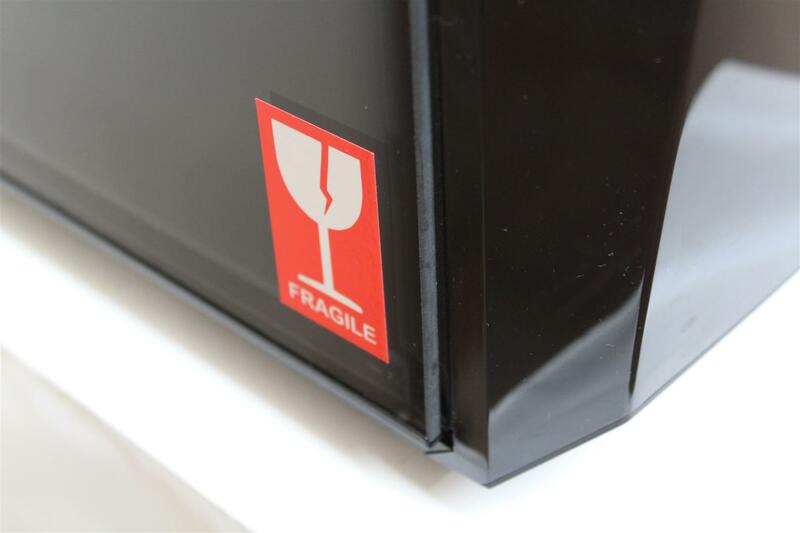 4mm thick side tempered glass panel. 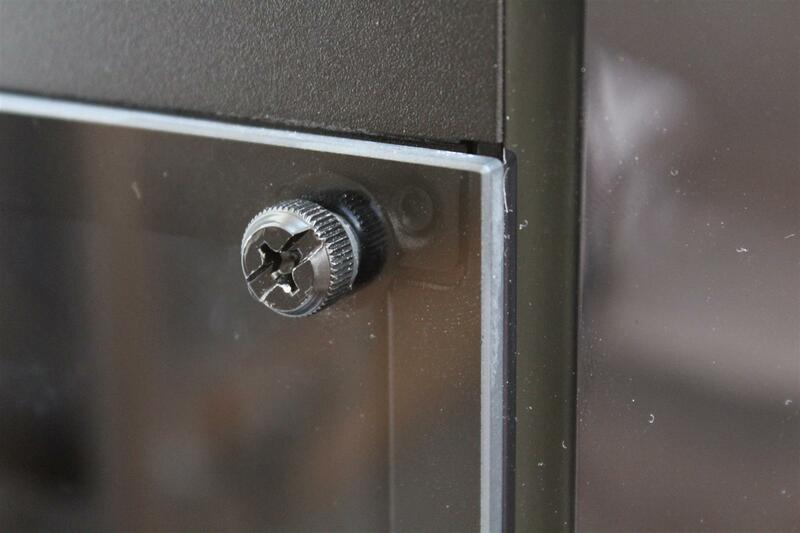 which comes with a long metal bottom u-shaped bracket and two thumb screws with rubber spaces for easy and secure panel installation. 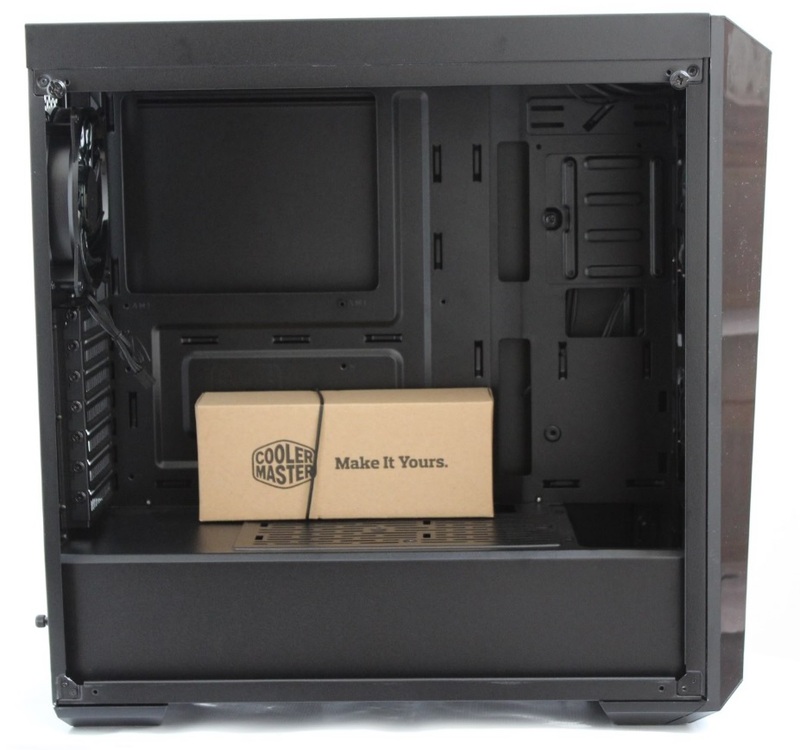 We see a small cardboard box inside containing extra top and bottom customizable trims to give a custom colour theme touch to the case. 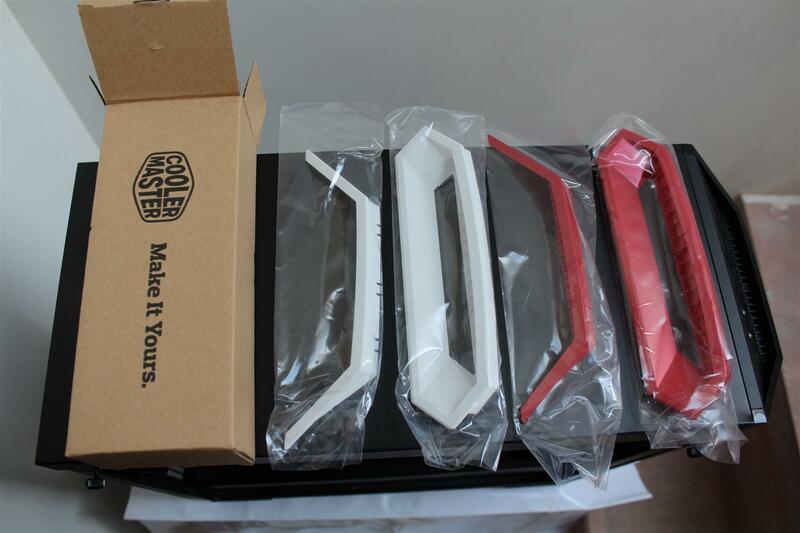 Red, white or black. 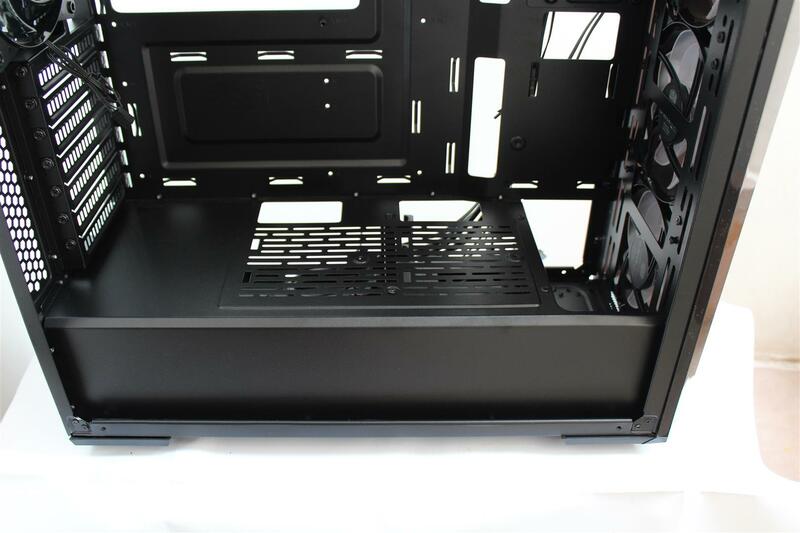 Back of the case have a big opening at motherboard mounting place for easy CPU back side access for cooler installation. 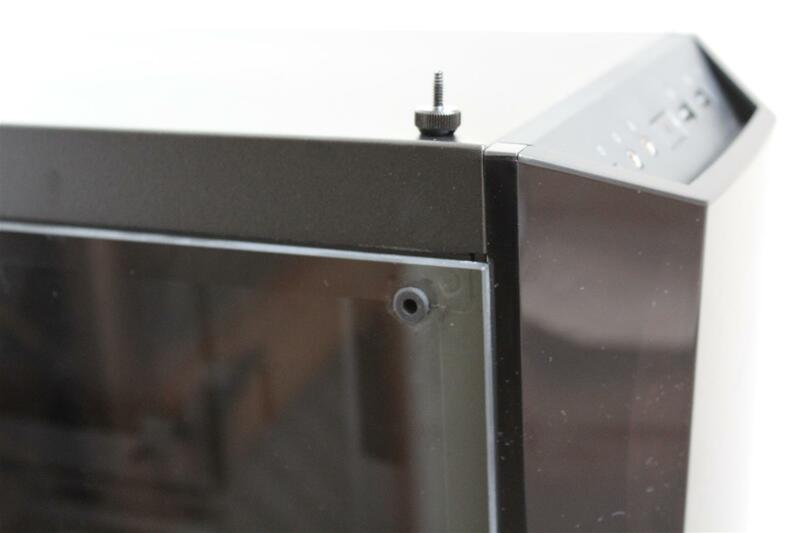 Also we have lot of cable tie points for nice cable management. 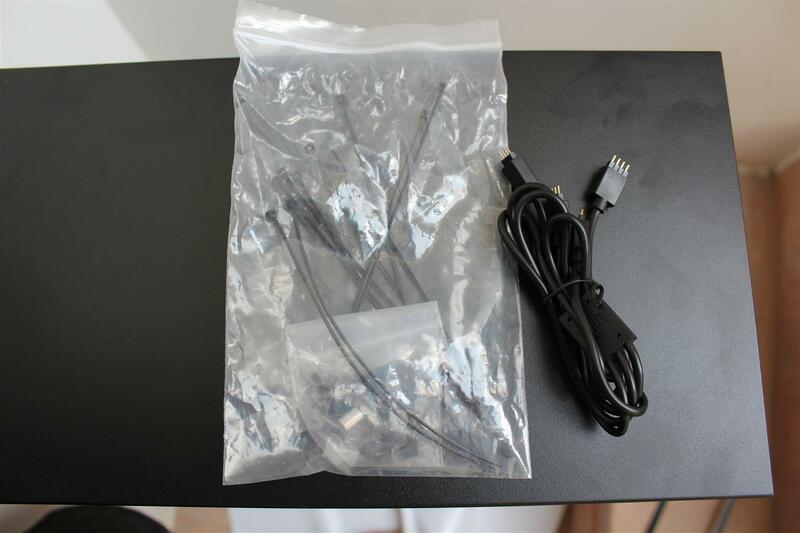 We also provided with all the installation screws and some zip ties, along with a 1 to 3 splitter cable for RGB LED fans . 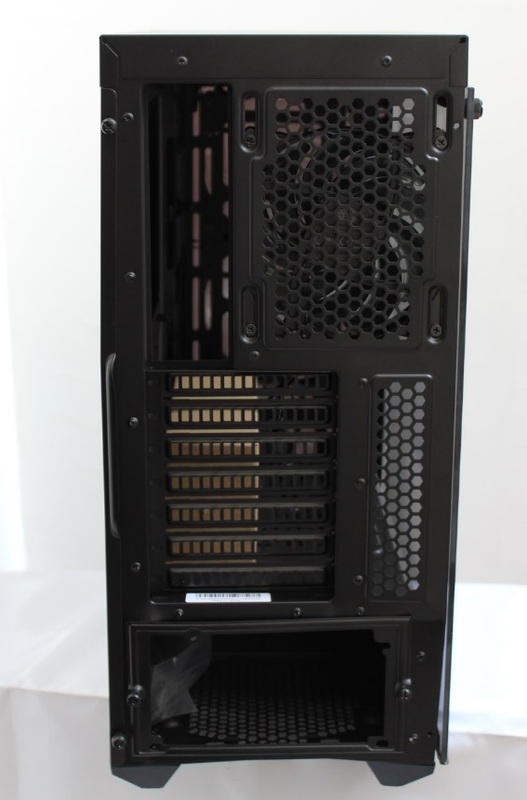 Bottom PSU mount with four rubberized standoffs and big fan grill with filter mesh. 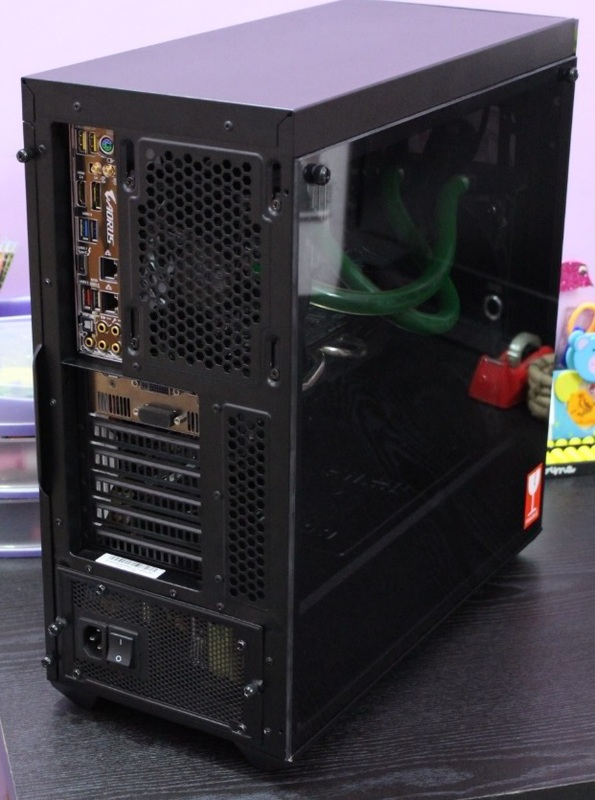 Which can easily be removed from bottom of the case. 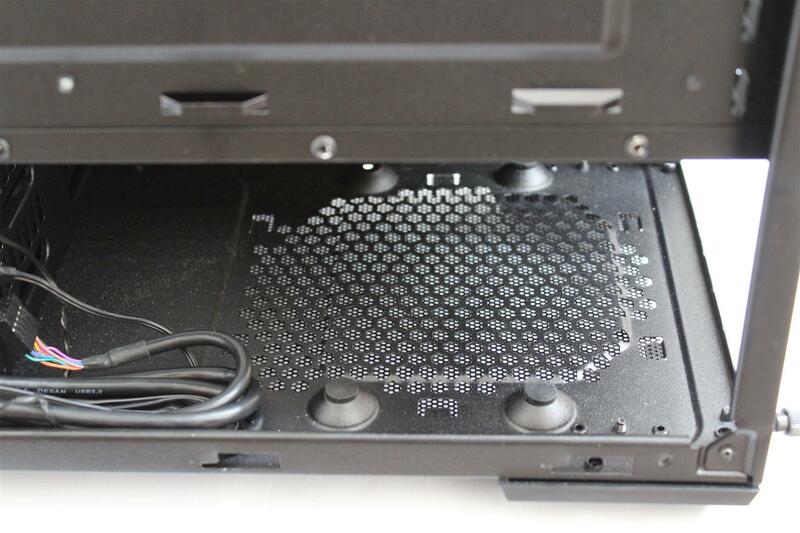 Full PSU cover with two SDD mounting points. 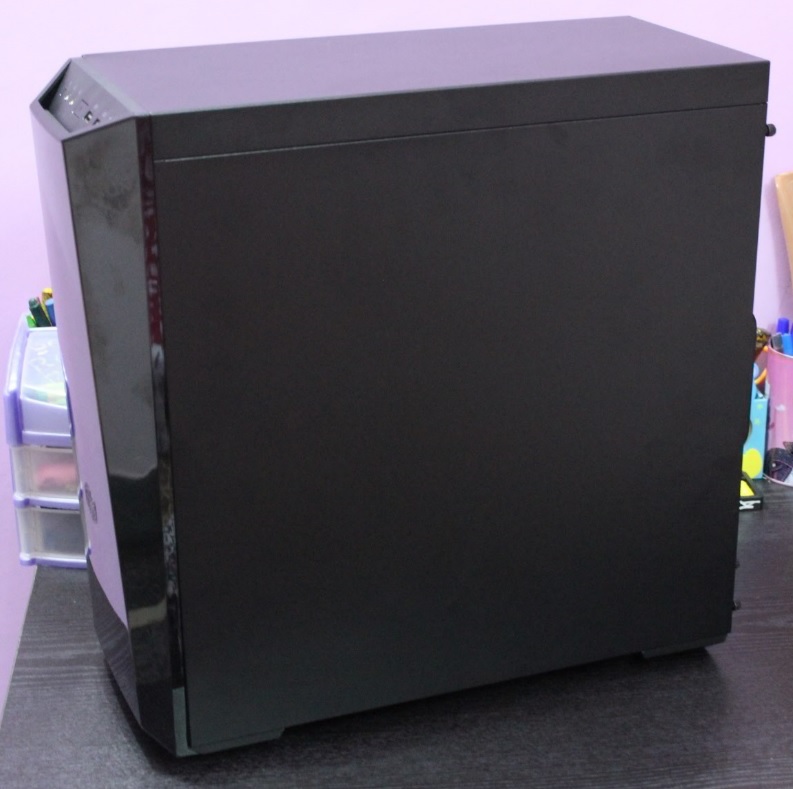 This case have total of 4 SDD mounting points beside two 3.5 HDD mounting bays, but comes along with only one SDD mounting plate. 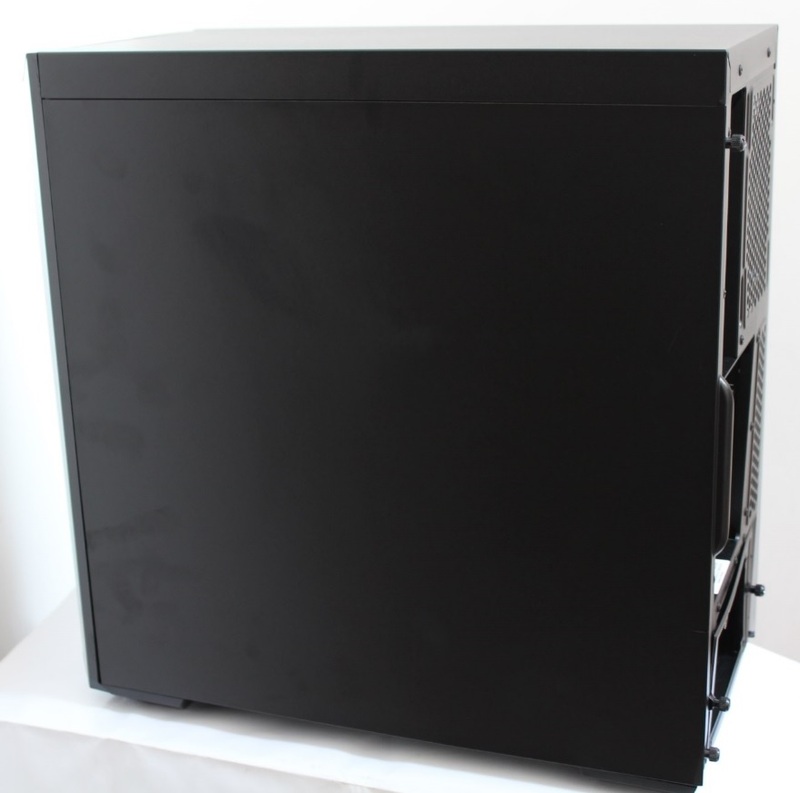 So you can only mount one SDD along with two HDDs at any one of the four provided places. 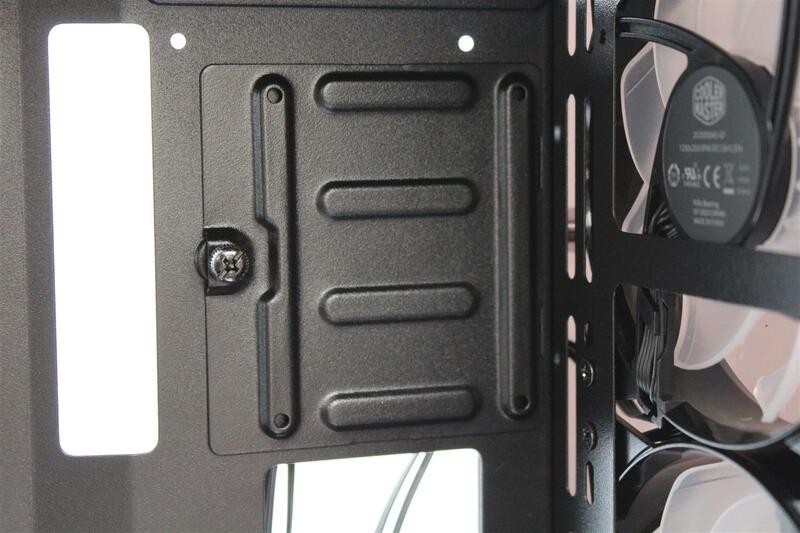 At least two mounting plates should be provided. 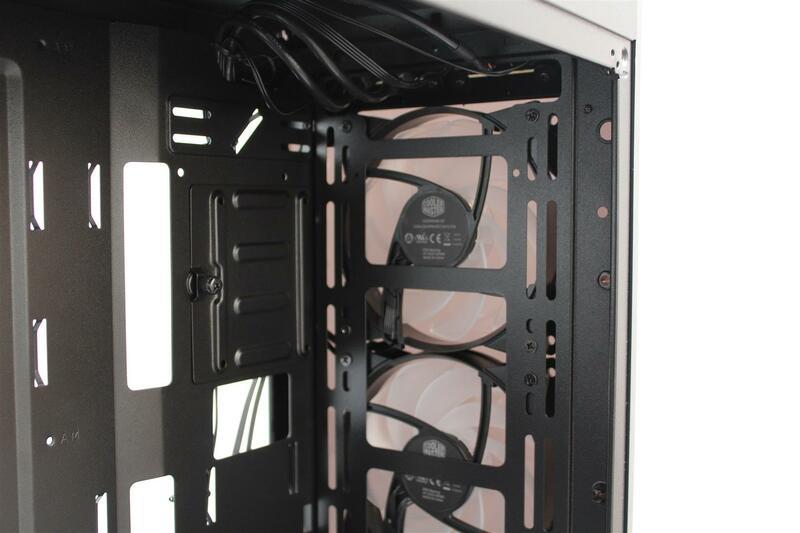 Three Cooler Master 120mm RGB LED fans installed in the front with two wires set coming out of each fan. 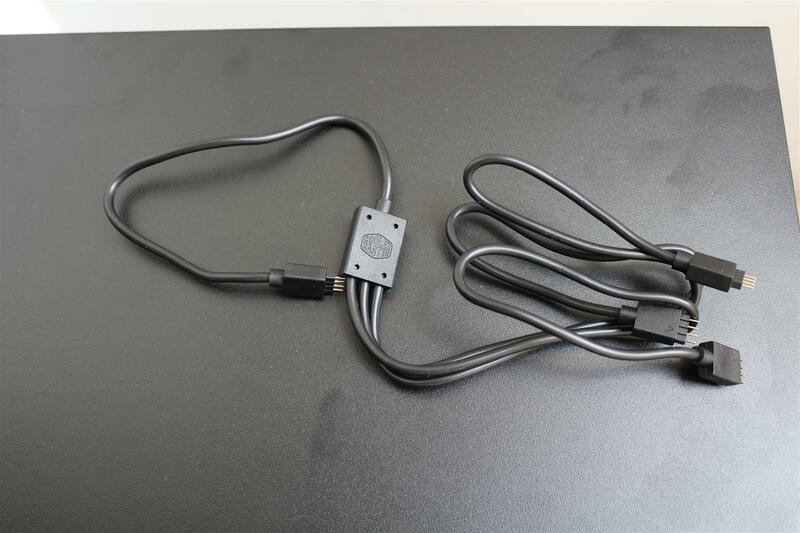 One for RGB LED connection and second is standard 3-pin fan connector. 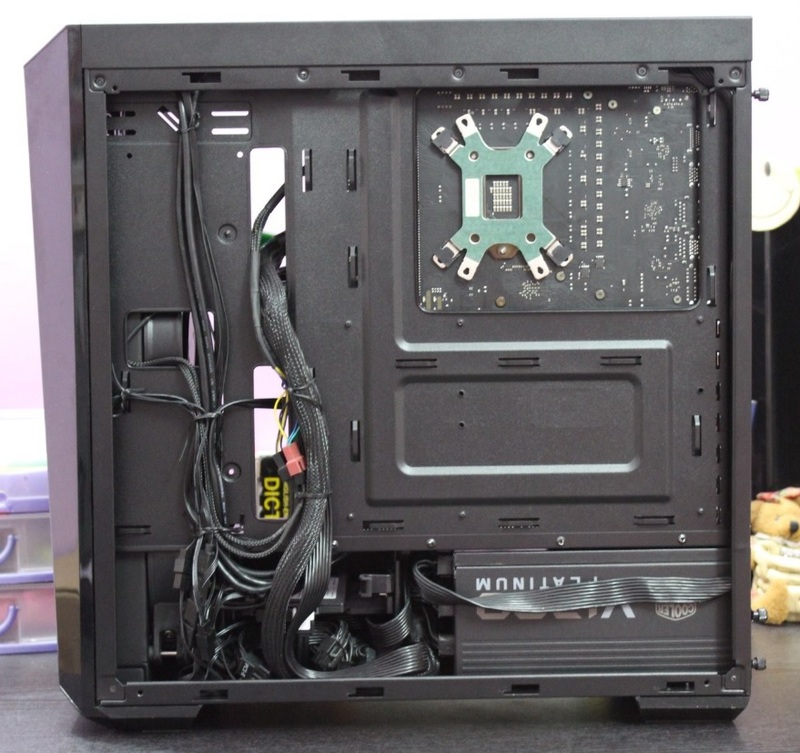 The 3-Pin header wire from each fan are too short in length (about 8 inch from front panel) and I was able to connect only one fan directly to my motherboard on to a fan header close to 24-pin ATX connector. 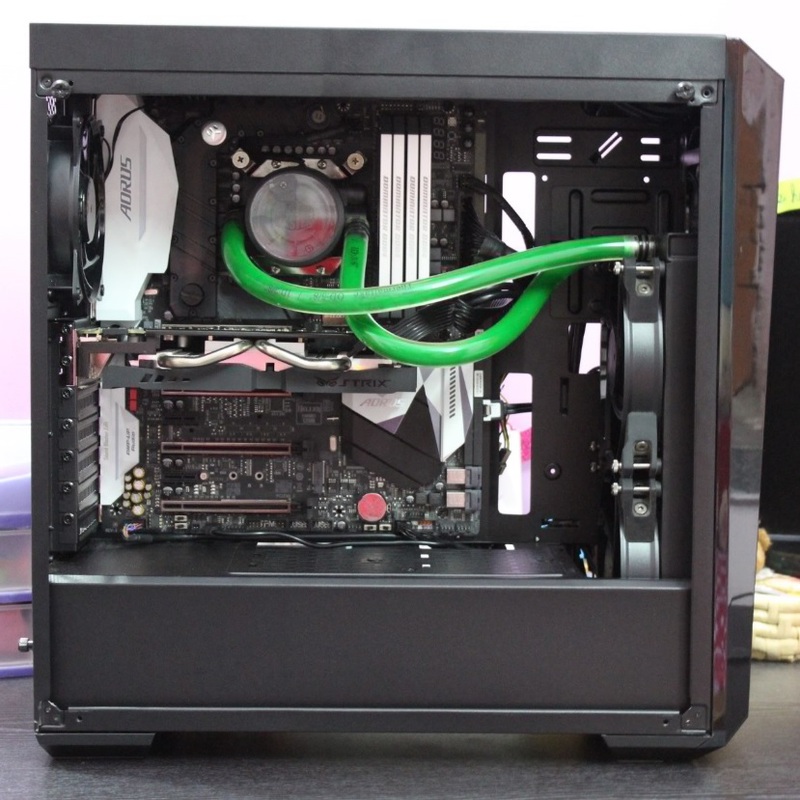 Rest two fans were connected using my own 3-pin fan extension cables. 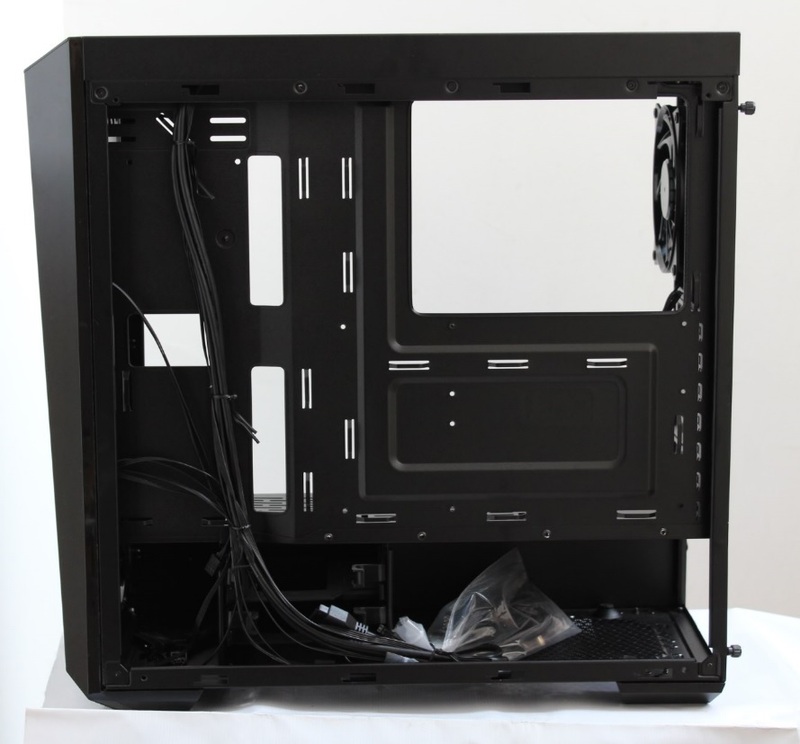 Case comes with a molex to 3 x 3-pin fan connector cable, but this will make the fans to run at max RPM all the time. 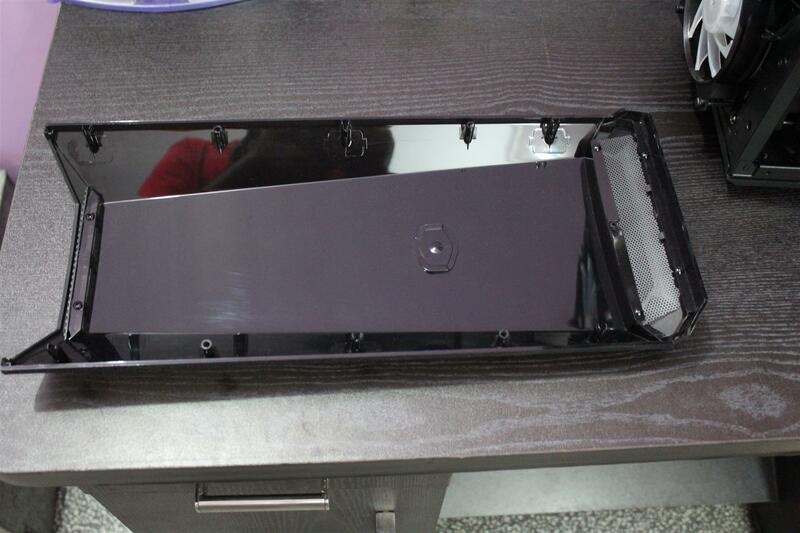 The DarkMirror front panel is made from Plexiglas and comes off easily for mentainence as one have to do a lot of dust cleaning with this case. 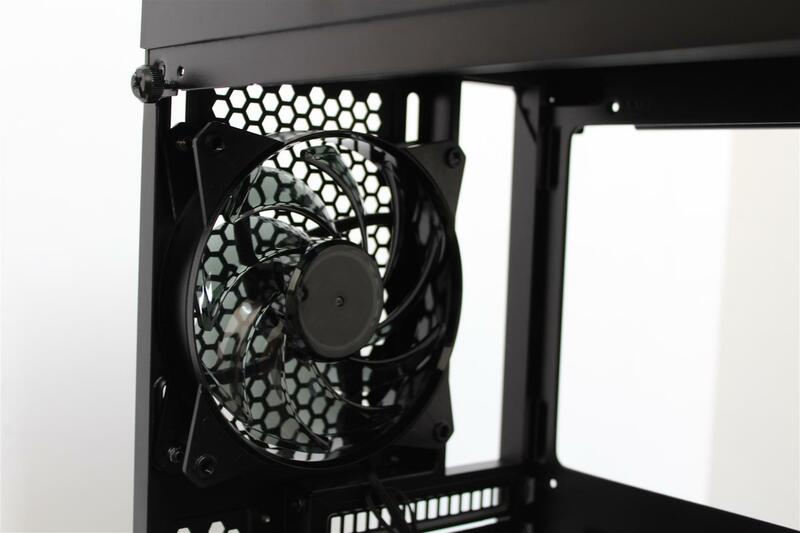 The air inlet for all three fans in front is a small opening at the bottom of the front panel which have a removable filter mesh. 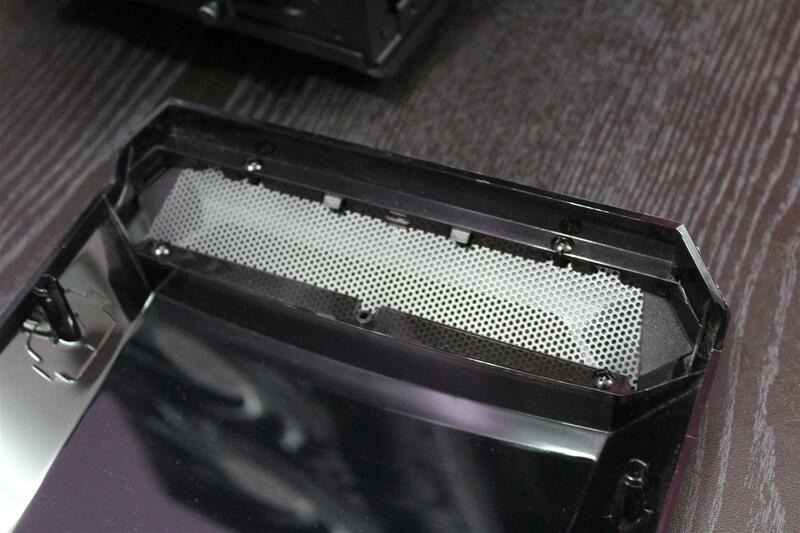 But with such a small inlet I am sure if this filter is not cleaned regularly it may result in higher system temperature. 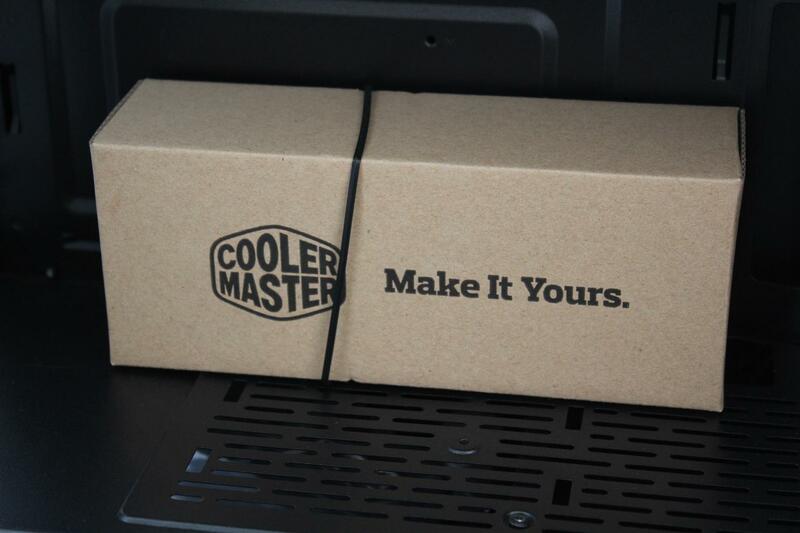 Components installation was easy and smooth in this case as other Cooler Master Cases. 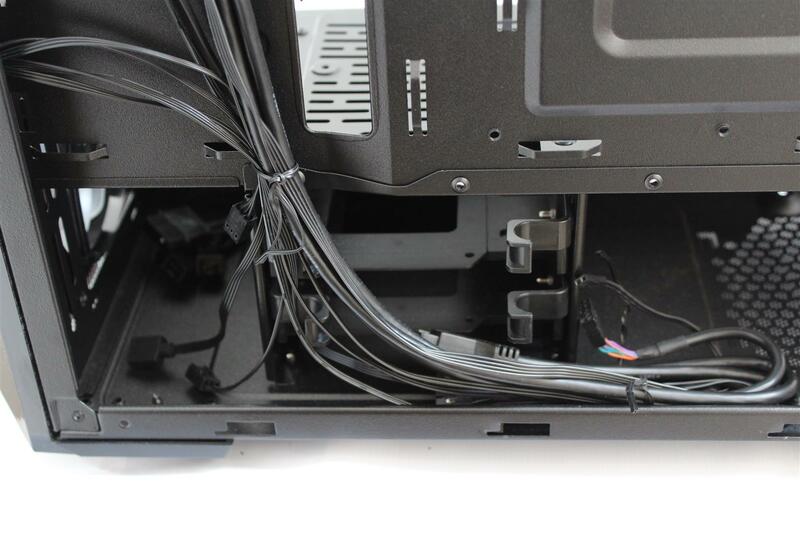 The case easily supported the extra long V1200 modular PSU with nice cable management options. 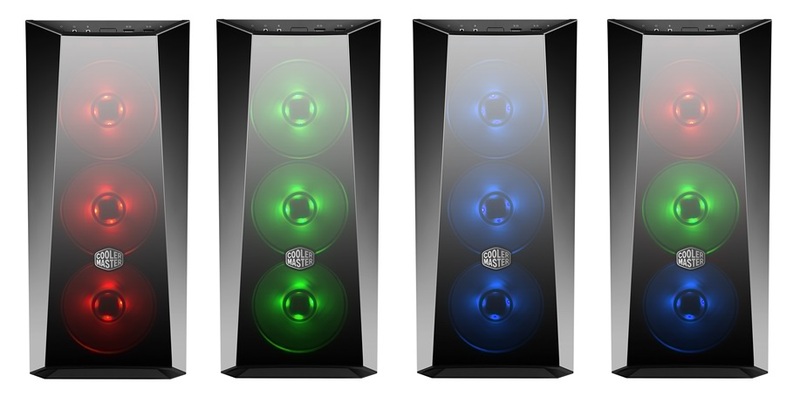 1 to 3 RGB splitter with major motherboards RGB lighting compatibility. 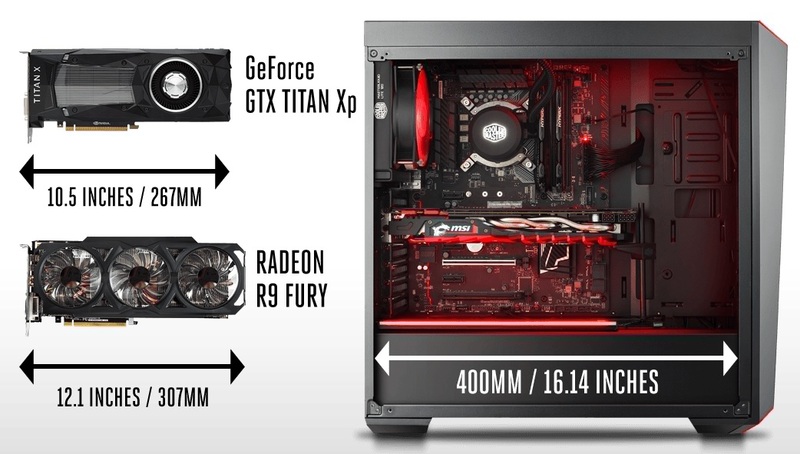 RGB fans have very short 3-pin wires. 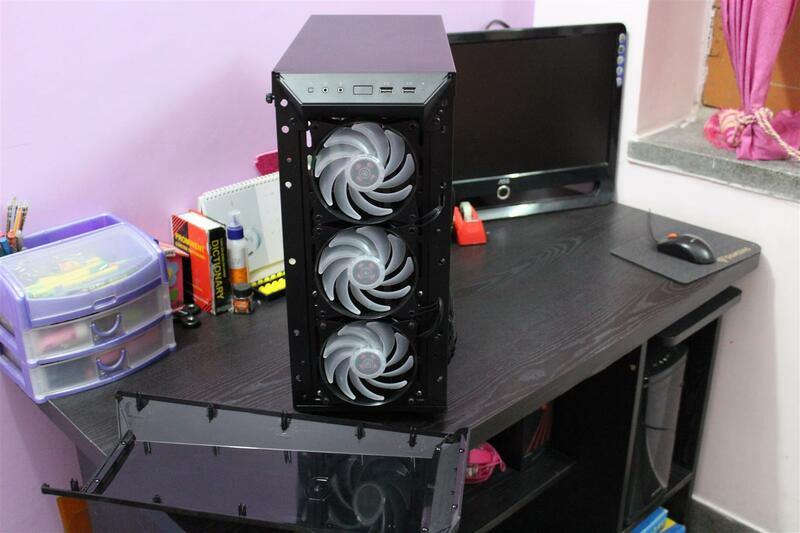 Included molex to 3 x fan cable which keep fan spinning at max all the time. 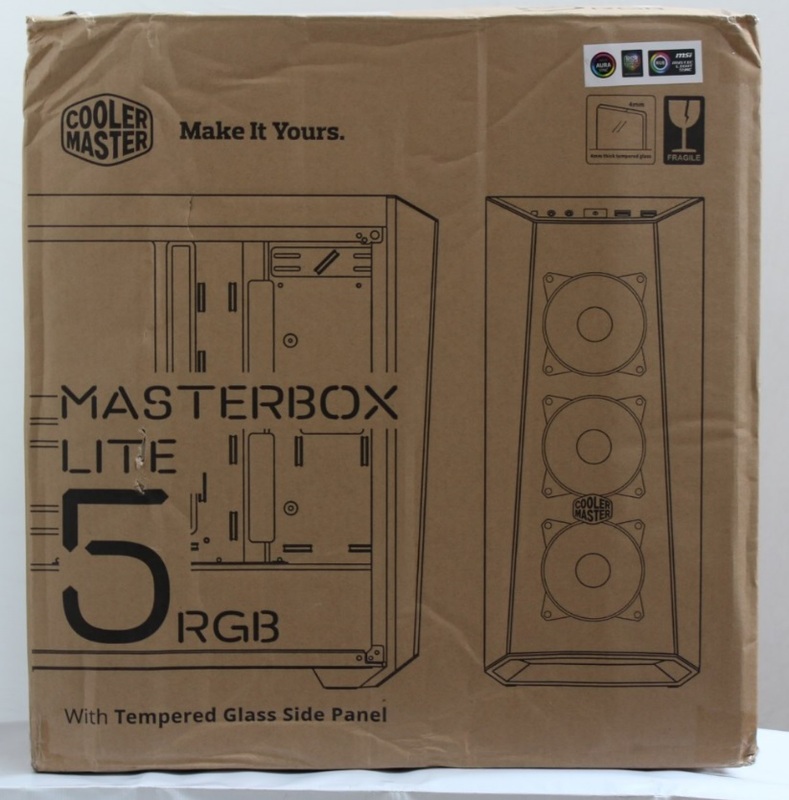 Cooler Master MASTERBOX LITE 5 RGB is aimed for gamer PC build at the budget with a price tag of INR 5K. 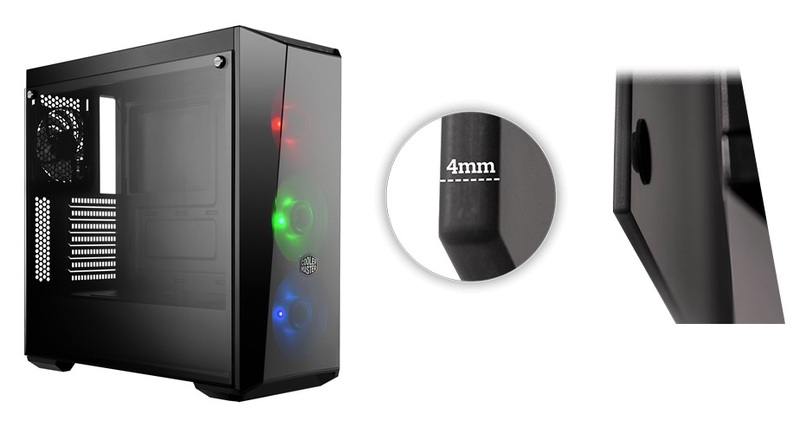 Considering the looks, RGB fans and design this case is winner for this price segment. 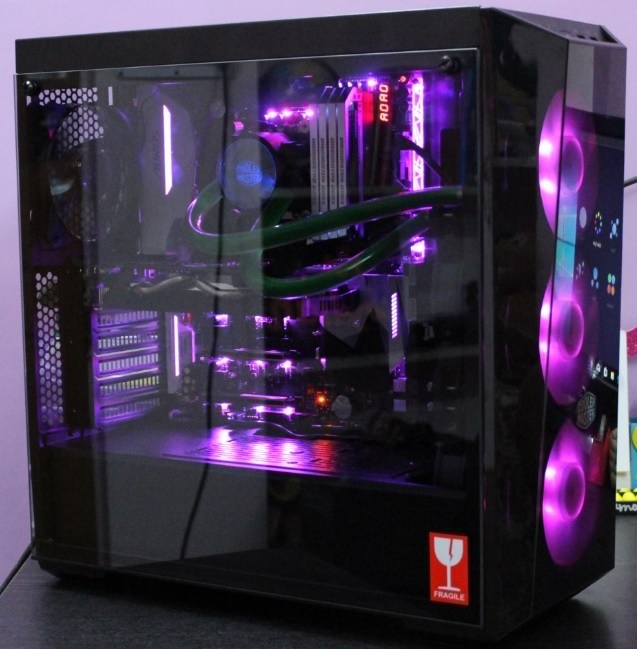 There are few places in the case where we can clearly see the price cutting in action, to bring the case for a budget price. 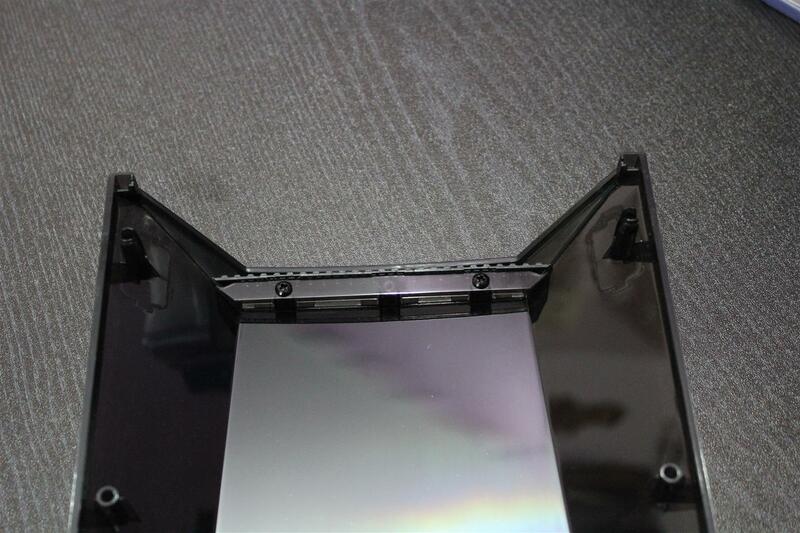 Like the metal sheet used is little thinner than other Master series cases, but still we didn’t found any compromise in case rigidness or frame stability. 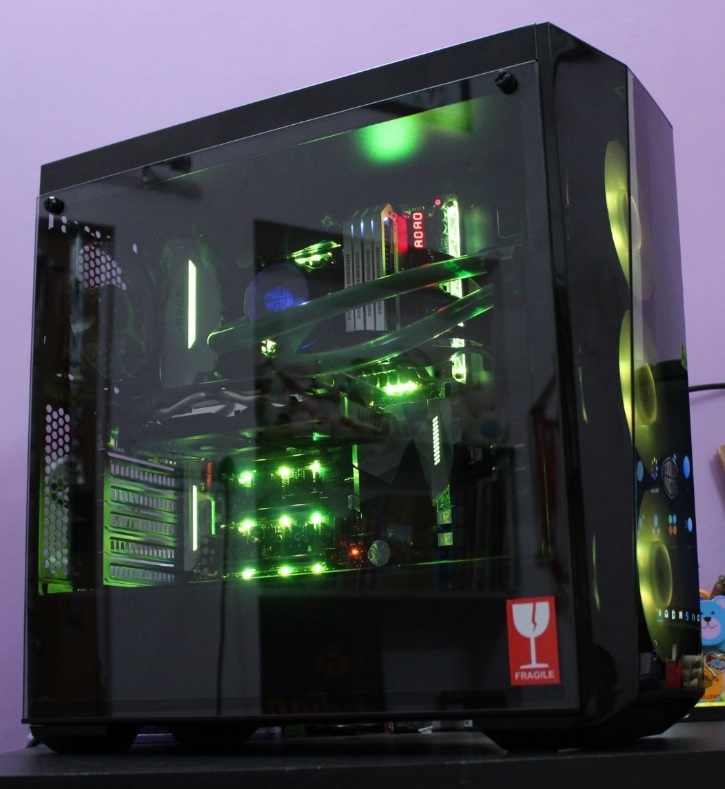 The RGB fans wire are too short for all of them to be connected to motherboard headers. 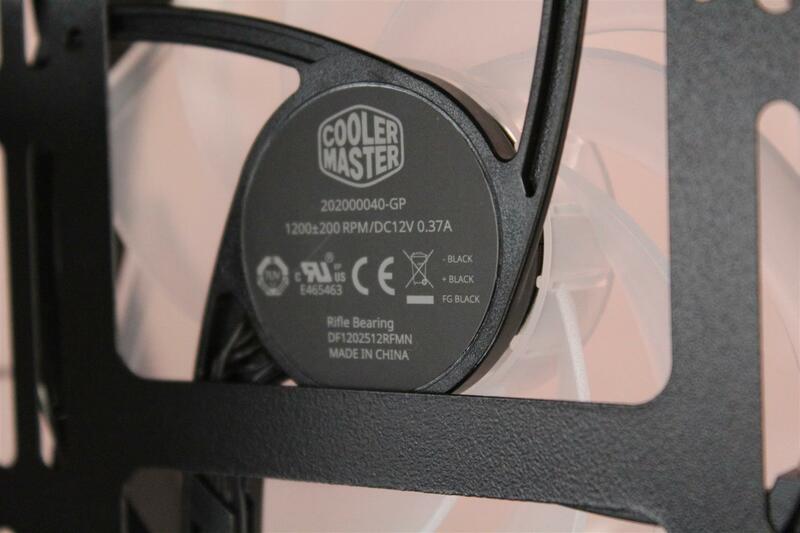 I request Cooler Master to increase the 3-pin fan wire length or provide fan extension cables along. 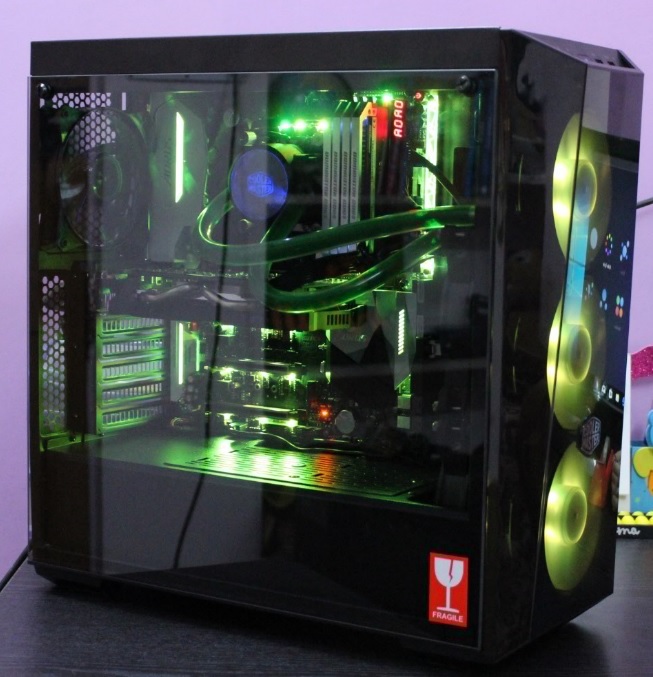 The RGB fans are very quiet and provide good air flow. 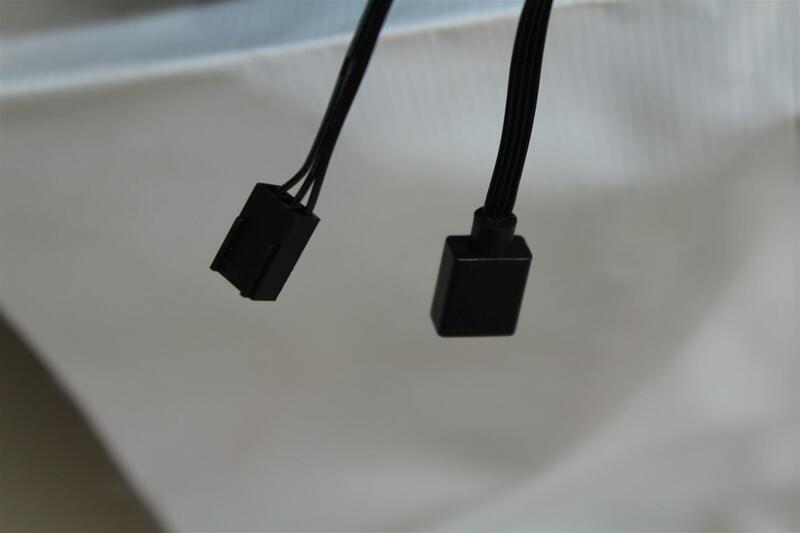 But due to shorter wires and unavailability of fan extension cables , one have to power the fan via provided molex to 3 x 3-pin fan connector cable, which will make the fans to run at max RPM and may result in some fan noise. 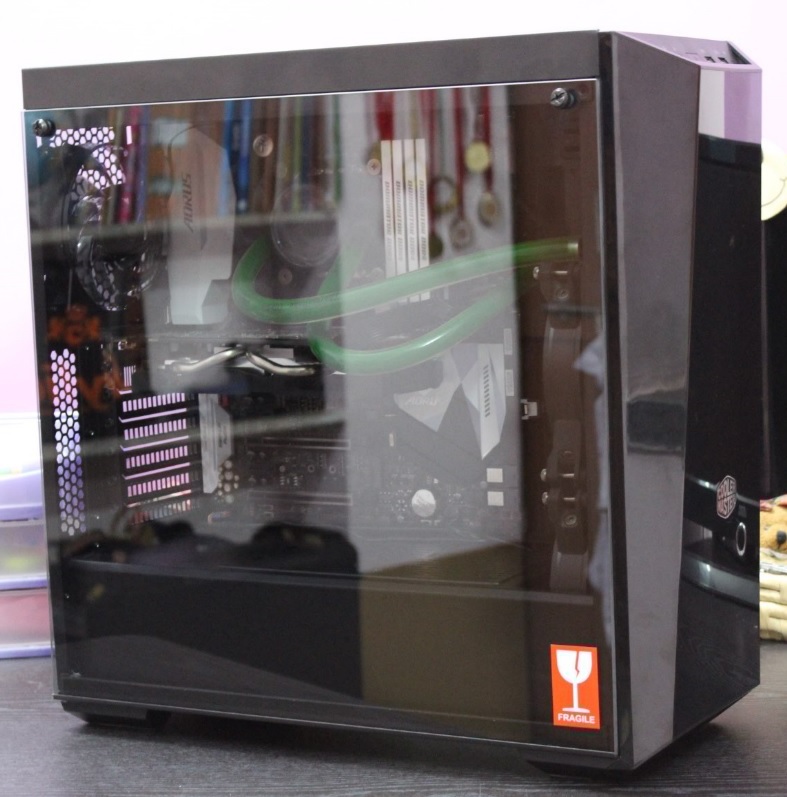 The tempered glass and front dark Plexiglas panel with three fan air inlet makes this case a dust magnet and need lot of duct cleaning. 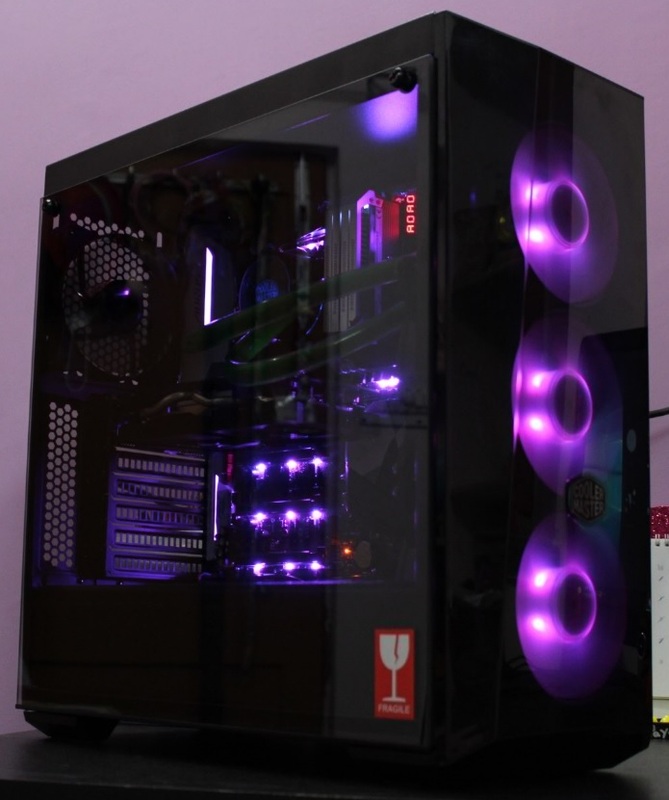 So at conclusion, we like to say that Cooler Master MASTERBOX LITE 5 RGB case is a great option for budget PC build with super good price and looks, worthy of our PC TeK Reviews Value Award.